Home→Holidays→Weather Capital of the World: Punxsutawney, Pa. Weather Capital of the World: Punxsutawney, Pa.
“Weather Capital of the World” may sound a bit presumptuous for a town of fewer than 6,000 residents. But judging from the swarm of visitors who descend on Punxsutawney, Pa., every Groundhog Day and the weather-related attractions spawned from the town’s popularity, the moniker may be appropriate after all. Every Feb. 2 since 1887, Punxsutawney Phil, the famed four-legged prognosticator, emerges from his burrow and predicts either the early onset of spring or a six-week prolongation of winter. The theory, of course, is that if Phil sees his shadow — an eventuality that has occurred on more than 100 of the groundhog’s 129 forecasts — six more weeks of winter will ensue. Surprisingly, the critter has “proven” the theory with an 80 percent accuracy. 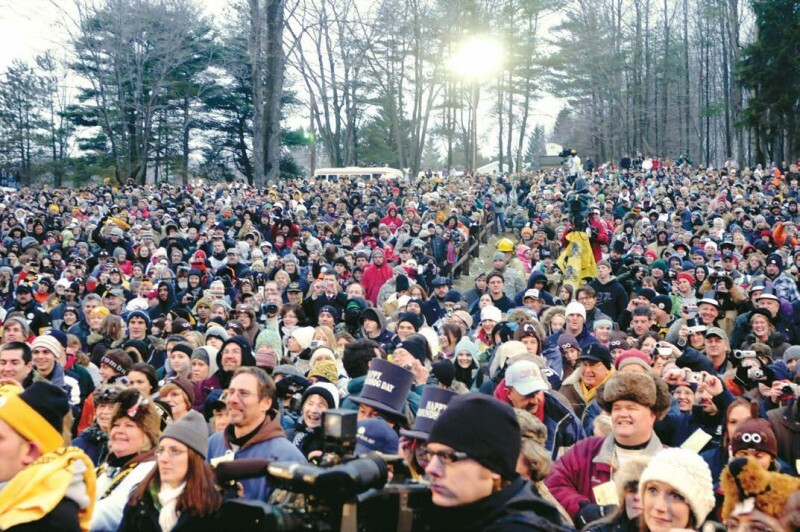 Upwards of 25,000 visitors have swarmed Punxsutawney for the annual event that actually occurs at Gobbler’s Knob, a small hollow on a wooded hilltop a couple miles outside of town. Crowds dwindled significantly in the 1970s but surged after the 1993 release of Bill Murray’s comedy movie “Groundhog Day,” even though the movie was filmed more than 500 miles away in Woodstock, Ill.
Devotees of the annual daybreak ritual stand in line at the burrow all night. At 3 a.m. a bonfi re is built to warm them somewhat. The Pennsylvania Tourism Bureau estimates the tourists yield as much as $5 million to the local economy. Th e 2,600 hotel rooms in Jeff erson County and its contiguous counties are booked solid. Some Punxsutawney restaurants enjoy quintuple their normal business. Phil’s famed yearly appearance belies his continuous presence in Punxsutawney in the form of several dozen bronze, plywood and fiberglass likenesses dotting the town. The real Phil lives in the “Groundhog Zoo,” an oversized terrarium built into the outside wall of the library on the town square, so passersby can view the famous critter. The town has seized upon his popularity to entice visitors year-round. The Weather Discovery Center opened downtown in 2001 in the former post office and is promoted as “a place where the science and folklore of weather collide.” Targeted especially toward children, the interactive museum includes tornado and lightning simulators, a “weather lore” section featuring a jar of forecasting leeches, a space shuttle thermometer and a green screen where visitors can play weather forecasters on camera. Visitors can also create their own thunderstorm, watch movies in the Catastrophic Theater and learn about the science behind extreme weather. As the lifespan of a groundhog in captivity ranges from nine to 14 years, many rodents have filled the role of the iconic critter.